When planning which variety of flowers to use at your wedding ceremony, you'll want to make sure that you choose blooms that are in season. The seasons each have their own distinctive and beautiful flowers to choose from, so it's sure to be easy to find some that suit your style and tastes no matter what time of year your wedding will be in. Flowers in season in the spring include the always-popular lilies and peonies, both of which are excellent choices for your wedding. Peonies make a fabulous bouquet, and you can never go wrong with white lily corsages. Another great example of an in season bloom for the springtime is the lilac, which blends its pleasant fragrance with an elegant look. Also consider mixing in apple and cherry blossoms with your bouquet or corsage, or as decorations for the wedding itself. Flowers in season in the summer come in many varieties, so you have plenty to choose from. Consider a bouquet of daisies to match the white of your wedding dress, or the peaceful beauty of dahlias or geraniums. The rose is one of the most popular flowers available, and it tends to be in season in the summer. A bouquet of roses is a perfect choice, or you could use them to decorate the church or reception. Autumn offers no shortage of beautiful flowers for your wedding. The rose is still in season at this time of year, so keep in mind the suggestions above. In addition, other flowers like chrysanthemums and sunflowers are in season in the fall, and lend your wedding a traditional beauty that many find appealing. Although the winter is not known as a time of year to grow flowers, florists are not limited by the weather thanks to greenhouses, indoor storage and other growing measures. There are many varieties considered to be in season during the wintertime, the most popular of which for your wedding would be the orchid. Orchids of any colour are both beautiful and steeped in tradition, which makes them the ideal choice for a winter wedding. If your special day falls close to the Christmas holidays, you may wish to consider using poinsettia blooms or holly as decorations for the ceremony or as part of your dress. Both are in season and boast an attractive appeal. 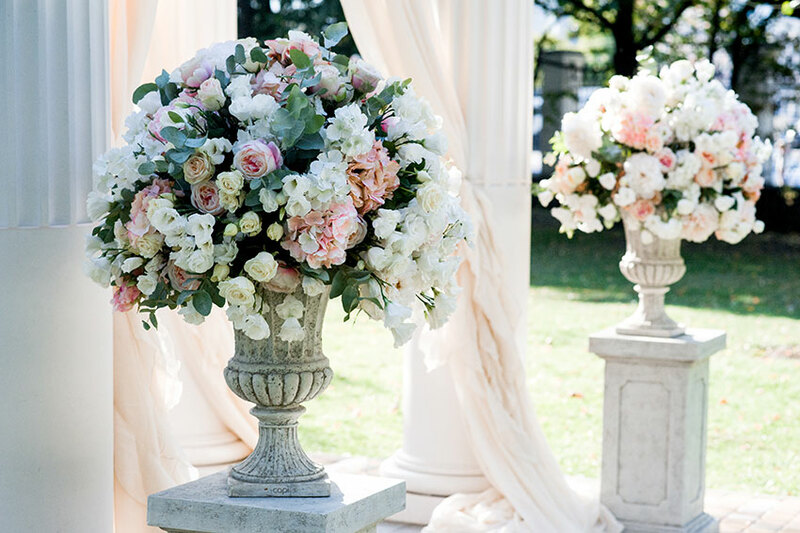 When considering which flowers to use for your wedding, or if you're not sure which are in season, consult a florist. They will be happy to help make your special day worthy of every page of the photo album.